Rohingya refugees gather under a makeshift tent in Ukhiya, Bangladesh, on September 3. 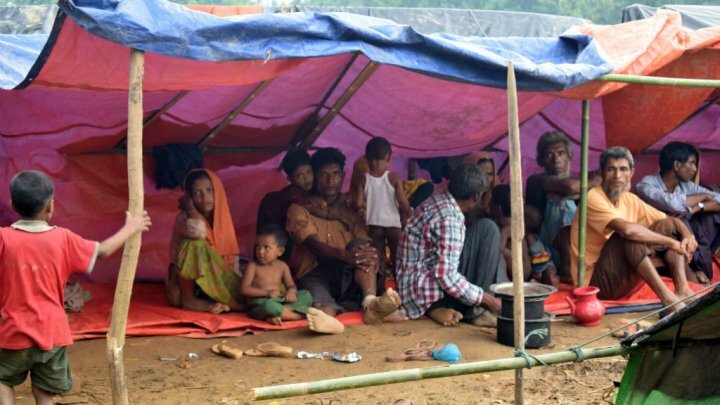 Some 87,000 refugees have fled to Bangladesh from Myanmar (Burma) since fresh violence erupted in late August, the UN said Monday, with most of those fleeing members of Myanmar's Rohingya Muslim minority. The violence in Myanmar was set off by a coordinated attack on Aug. 25 on dozens of police posts and an army base by Rohingya insurgents. The ensuing clashes and a major military counter-offensive have killed at least 400 people. Myanmar officials blamed the Rohingya militants for the burning of homes and civilian deaths but rights monitors and Rohingya fleeing to neighbouring Bangladesh say a campaign of arson and killings by the Myanmar army aims to force them out. The treatment of Buddhist-majority Myanmar’s roughly 1.1 million Muslim Rohingya is the biggest challenge facing leader Aung San Suu Kyi, accused by Western critics of not speaking out for the minority that has long complained of persecution. The number of those crossing the border - 87,000 - surpassed the total of Rohingya who escaped Myanmar after a much smaller insurgent attack in October that set off a military operation beset by accusations of serious human rights abuses. The newest estimate, based on the calculations of United Nations’ aid workers in the Bangladeshi border district of Cox’s Bazar, takes to nearly 150,000 the total number of Rohingya who have sought refuge in Bangladesh since October. “We are trying to build houses here, but there isn’t enough space,” said Mohammed Hussein, 25, who is still looking for a place to stay after fleeing Myanmar four days ago. An unofficial camp for Rohingya refugees that sprang up at Balukhali after the October attacks is being dramatically expanded. Hundreds of Rohingya milled beside the road while others slung tarpaulins over bamboo frames to make rickety shelters against the monsoon rains. More than 11,700 “ethnic residents” had been evacuated from northern Rakhine, the government has said, referring to non-Muslims. Turkish President Tayyip Erdogan, who said on Friday that violence against Muslims amounted to genocide, last week called Bangladesh’s President Abdul Hamid to offer help in sheltering the fleeing Rohingya, the south Asian nation’s foreign ministry said. The statement did not clarify if financial assistance was offered.